As mining engineering professor Richard Ash stated in 1963, an explosive is simply a tool for performing work. Selecting the right tool for the right job is just as critical with explosives as it is with a hammer. As such, one needs to properly understand that the reason explosives made out of ammonium nitrates are extremely effective is due to the large amount of gas pressure they produce. If shock was the major breakage mechanism, explosives like TNT and nitroglycerin would be far superior. In today’s commercial explosive industry, ammonium nitrate explosives are most commonly used in the form of ANFO and emulsion. Back in the 1960s, explosive functionality relied on the ability to oxygen balance explosives to increase the amount of gas pressure produced. Today, explosive engineers must not only understand the principles of the chemical composition of explosives, but the explosive’s physical characteristics to ensure the mixtures are optimized to produce maximum gas pressure in the fastest time possible. Today’s commercial explosives are mixtures of compounds that contain carbon, hydrogen, oxygen and nitrogen. In specific situations, inorganic compounds such as sodium, calcium and aluminum are added for various effects. Often, the addition of inorganic materials (with the exception of aluminum) is an effort to reduce the manufacturing cost. This results in inferior explosive products. The goal of an explosive is to produce maximum gas pressure in the fastest time possible, and the addition of molecules such as sodium and calcium reduces the total gas pressure in a product. When these molecules are present in a detonation, they use oxygen and form solid products, robbing oxygen from forming gases and wasting it in the formation of solids, which do not provide pressure for breakage. Aluminum is the exception, as it is typically added to increase the heat of the explosive, which, when properly added, can provide additional gas pressure, even though it is converting to a solid product. The aluminum releases large amounts of heat when it reacts and heats the gases formed from the other ingredients. When an explosive does not contain these inorganic compounds, three gases are created. The first will be in the reaction of the hydrogen and oxygen to produce steam, which will be light gray to white in color. The carbon then reacts with the oxygen and, assuming perfect oxygen balance, carbon dioxide will be formed. Finally, the nitrogen will combine to form nitrogen gas. This is true under ideal conditions with exact oxygen balance, but due to poor explosive formulations and problems in manufacturing, these conditions are rarely observed in today’s marketplace. When explosives with either formulation or manufacturing defects are encountered on a blast, other gases are produced that are not only not ideal for energy release, but can be extremely toxic and dangerous to the health and safety of workers. Under-fueling an explosive product results in the production of more oxygen than the explosive requires. This leads to oxygen combining with the free nitrogen and the formation of nitrous oxides (NOx), which are a reddish orange to yellow in color. Nitrous oxides are extremely toxic to human health and will lead to burning of lungs, creation of acid in the lungs and the drawing of body fluids into the lungs. This is one of the most toxic gases that can be encountered from an explosive product. In addition, under-fueling an explosive product results in dramatic decreases in the explosive energy. When an explosive is over-fueled, it has excess carbon and an inadequate amount of oxygen. This leads to the formation of carbon monoxides and can lead to small amounts of carbon formation. Carbon monoxide is a toxic gas that binds to red blood cells, replacing their ability to carry oxygen to cells in the body. This is a cumulative gas that builds up in the body over a six-month period and has no color or odor to it, making it impossible to detect without a gas detector. For reasons such as these, it is critical to ensure that the chemical formulations of the explosive are proper and any explosive used on site is near oxygen balanced. With ANFO, the oxygen balance is at 5.7 percent. It is normally stated as 6 percent, oil to ammonium nitrate. Sites then create the specification to have ANFO oiled to 6 percent, plus or minus 0.5 percent. With emulsions, the exact amount varies based on the amount of ammonium nitrate used in the formulation. Generally, explosive products are under-oiled to save manufacturers money. This, however, can lead to extreme energy losses and the formation of nitrous oxides for the client. A simple method to determine if the explosive is performing poorly is to view the blast. If any reddish orange or yellow fumes are present, this is a telltale sign that the explosive product is of poor quality. In almost all situations, it is not geology or water that causes NOx to form, but the actual explosive product. The water resistance of the explosive is the major defining property in almost all situations for the selection of explosive products. This is because modern explosives have very similar properties to one another in almost all other regards, except for the water resistance and price of the explosive. ANFO requires a minimal capital investment and is extremely easy to produce, store and transport. As such, it is a very low-cost explosive. Still, the slightest bit of water will cause ANFO to dissolve, causing either a large loss in energy or no detonation to occur. Because it is well known that ANFO has no water resistance, emulsions are used in places that have water in the boreholes. Emulsions have good water resistance but are more costly than the ANFO counterparts. The use of Heavy ANFO and blends (ANFO and emulsion mixtures) have also allowed operators to benefit from the additional energy and lower cost of ANFO while having some water resistance from the emulsion. Typically, a 60/40 (emulsion/ANFO) blend will offer water resistance, but this cannot be used in situations where water flows through boreholes or the explosive will be slept in wet boreholes for long periods of time. Heavy ANFO will typically not have water-resistant properties. ANFO and emulsion typically both have very good fume qualities when properly manufactured, but both can have degraded performance and develop toxic fumes from improper manufacturing. In a majority of cases, large amounts of toxic fumes generated from a blast are the direct result of improper chemical formulations or manufacturing. 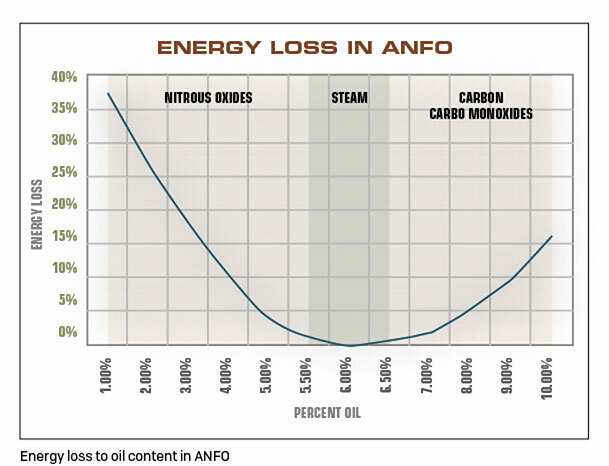 Remember, ANFO is very sensitive to oil content, and, should oil content vary, toxic fumes will be generated. Emulsions can also generate fumes such as NOx and carbon monoxide for a number of reasons, the first of which is improper chemical formulations that do not have proper oxygen balance. To analyze this, end users need to send away samples to labs or consultants for testing. Other problems with the emulsion can occur when improper emulsifiers is present, or not enough emulsifier is used. This can lead to a breakdown of the product, which can be observed in fume formation. Additionally, crystallization of the emulsion through improper manufacturing, or using material well past its shelf life, can lead to fume generation. Blends of ANFO and emulsion typically exhibit moderate fumes due to the mixing of these two explosives. In almost all cases, when a blend (more emulsion than ANFO) is created, the manufacturer instead uses fertilizer-grade ammonium nitrate. This not only can cause oxygen imbalances but dramatically separates the fuel from the oxidizer, leading to non-ideal detonation. Due to this and other reasons, blends typically generate more toxic fumes than either ANFO or emulsion alone will. All commercial explosives today have about the same sensitivity, as they are classified as 1.5 products by the Department of Transportation. These products require a booster in order to detonate, and studies throughout the years show that a 150 g booster reliably detonates all products with no loss in energy to the blast. This indicates that no advantage is obtained by using boosters larger than 150 g.
However, should ANFO be improperly oiled or should it be stored in conditions that cause prill to cycle and change the sensitivity of these products, then ANFO can become cap sensitive. Ammonium nitrate has a base density of 1.73 g/cc, but commercial explosives never exhibit densities close to that. Typically, ANFO ranges from 0.80 to 0.90 g/cc, with an average range of 0.84 to 0.86 g/cc due to the fact that prills entrapped air and that prills are not finely ground. Should ANFO have extreme cycling where prill size is dramatically reduced, the density will increase. Emulsion has two different ranges for densities, where booster-sensitive emulsion is typically between 1.20 and 1.27 g/cc and cap sensitive emulsion around 1.15 g/cc. Blends will then fall within ANFO and emulsion ranged based on the percentage of each product used. Emulsion has a density of about 147 percent that of ANFO, meaning many more pounds of emulsion can be added to a borehole. This can result in pattern expansion, solely due to the fact that more pounds can be placed into a specific volume. Still, because explosive is paid based on pounds and not on volume, and because emulsion is typically much more expensive than ANFO, it is almost never economical to switch to an emulsion product for the purpose of pattern expansion. This is also true with all blends. The only product that can replace ANFO for slight pattern increases where the increase offsets the additional cost is a Heavy ANFO where a small amount of emulsion is added to replace the air between ANFO prills. Two types of strength exist when comparing commercial explosive products: the relative weight strength (RWS) and the relative bulk strength (RBS). Properties such as detonation pressure and velocity of detonation are not strength indicators, as the shock from a commercial explosive has no effect on rock breakage. 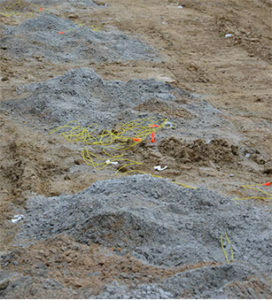 Therefore, the RWS and RBS are used to compare the explosives. The RBS of an explosive is the energy per unit volume of an explosive when it is compared to ANFO. So the RBS of ANFO is either 100 or 1.00, depending on the manufacturer. The RBS of emulsions typically ranges between 110 and 140, depending on production factors. This means on a per volume basis, emulsion is a more powerful explosive than ANFO. The RBS of an explosive is a strength indicator in the practical sense and is a good sales tool for selling more expensive emulsion products. The RWS of an explosive is the energy per pound of explosive compared to ANFO, where the RWS of ANFO is equal to 100. The RWS of emulsions is typically between 80 and 95, meaning that, pound for pound, emulsions are weaker explosives than ANFO. This means you pay more money for 90 percent of the energy on a pound-for-pound basis when comparing emulsions to ANFO. 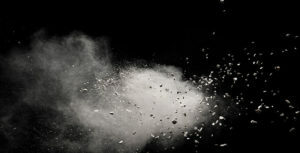 When analyzing the best explosive for use at an operation, the decision comes down to the environment in which the explosive will be used and what is most cost-effective. The main environmental consideration is whether the blastholes will be wet or dry. If the boreholes contain water, then the only available explosives are emulsion or a blend that is greater than 60 percent emulsion. In this case, the major decision will be based on the loading capabilities at the site and the cost of blends versus emulsions. 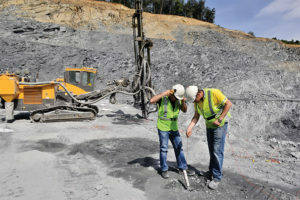 It will be critical in this phase, too, to analyze drilling costs to determine if slightly cheaper blends provide an advantage over the emulsion. The blends may require more drilling cost compared to the emulsion. Should the boreholes be dry, ANFO is almost always the most economical choice – unless drilling costs are extremely high. 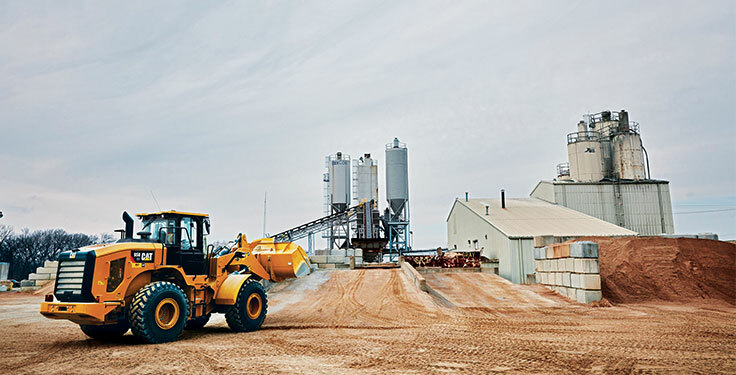 In almost all situations, blasting in dry ground will lead to ANFO being the most economical, easiest to load and lowest risk to the mine in the event of misfires or bad product. Therefore, ANFO has taken over 80 percent of the explosives market in recent years. Consider, too, that different products will result in different fragmentation and throw, and environmental factors and proper testing should always be completed on site to determine the optimal explosive. In 1963, Pit & Quarry published a series of articles on the mechanics of blasting authored by Richard Ash, a longtime professor of mining engineering at the School of Mines & Metallurgy at the University of Missouri-Rolla. 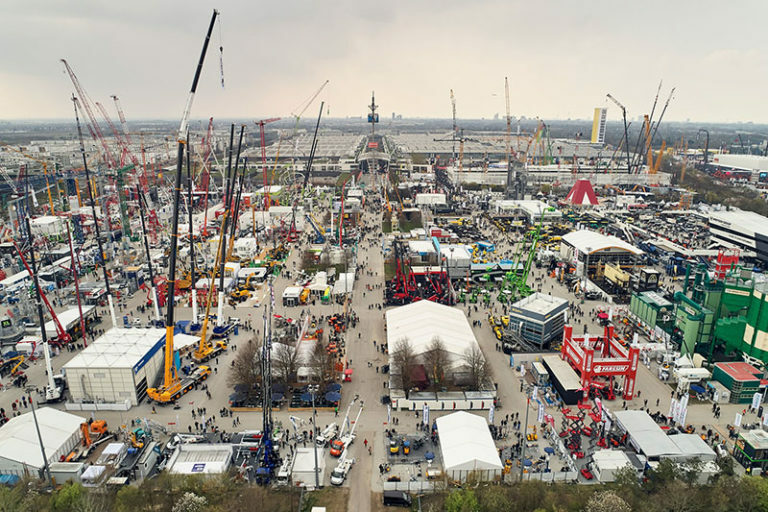 The content within each article was ahead of its time, putting forth cutting-edge concepts about the mechanics of rock breakage, standards for blasting design, the characteristics of explosives, material properties, powder factor and the cost of blasting. 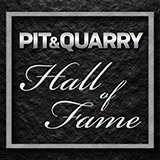 The Academy of Blasting & Explosive Technology, including Anthony Konya and Dr. Calvin J. Konya, pay tribute to the time-honored principles Ash put forth more than 50 years ago with a special 2019 series for Pit & Quarry readers. In their “Blasting Mechanics Revisited” series, the Konyas look back on Ash’s work and explore how modern-day technology and methods currently fit into each of the areas Ash covered a half-century ago. Look for one final article in the series from the Konyas next month. 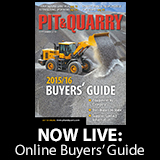 Visit pitandquarry.com to read Parts 1 and 2. Anthony Konya is the senior explosive engineer for Precision Blasting Services who consults around the world in rock blasting and vibration from blasting. He is also an instructor for the Academy of Blasting & Explosive Technology. Calvin J. Konya is the president of Precision Blasting Services and director for the Academy of Blasting & Explosive Technology, consulting and training worldwide in rock blasting, vibration and emulsion manufacturing.